You can’t even deny it—leather is the scent of the refined gentleman. Whether it’s wallets, watches or briefcases, we’ve scoured the net and found the best of the best. So hop on into your leather seated- Infiniti, head on home to your leather couch, and add even more leather to your collection. Can’t get enough? Neither can we—check out our editor’s picks from leather journals and phone cases, to beard comb cases and belts. 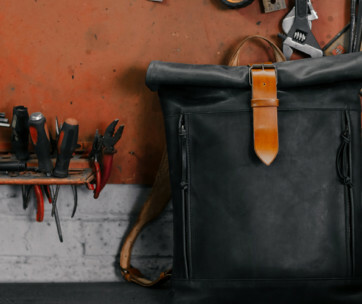 The best leather gifts for men are here. When someone speaks of Levi’s images of a rugged and manly cowboy is always conjured in the mind. If not, one can always equate the brand to denims and other similar apparel that has come to epitomize carefree and relaxed fashion. With Levi’s Men’s Reversible Belt, the company’s reputation in the design and manufacture of high quality jeans and jackets is ingeniously extended into this amazing fashion accessory. Made of bonded leather plus a combination of split leather and polyurethane, you’d definitely feel more fashionable with this Levi’s creation around your waist and keeping your jeans or any type of pants up. This also makes a perfect Christmas gift for your dad. The feel of genuine leather on your fingertips can never be replicated by any high tech gadgetry. No virtual technology can ever provide you with the sensations of real, authentic leather. That’s why serious folks still prefer writing their thoughts and inspirations on the pages of the Moonster Leather Journal before binding these with an elegantly handcrafted leather strap that makes the journal look more like a very precious antique straight from an ancient Egyptian, Sumerian, or even Mayan archeological site. The horse leather material also allows ingraining of your own design making the Moonster one of the spectacular leather gifts idea for men. Make sure you also check our list of top diary planners for more great items like this. You don’t have to sweat carrying your bulky laptop on some cheap fabric. For the true road warrior of today, you deserve nothing less than the finest quality of genuine cowhide leather put into the Samsonite Colombian Laptop Bag. Designed like a nifty and utilitarian messenger bag, the Colombian features a spacious interior fully capable of holding 15.6-inch laptops plus a whole bunch of documents, folders, and files, making it one of those exceptional men’s leather gifts. The straps won’t weigh you down either as it comes fully padded. If slinging over your shoulder is not your thing, you can always carry it like a briefcase. Our handy guide to the top laptop bags features more great products like this. The Samsonite Leather Expandable Briefcase is one of the truly remarkable leather gift ideas for him for the simple fact that its design is especially made to let you stand out in the crowd. It doesn’t have any fancy features or some obnoxious design element. 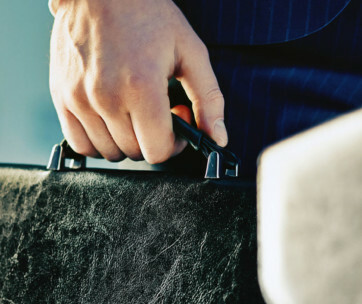 What you get is a very straightforward leather briefcase that’s meticulously planned for optimum organization of your work and office documents, files, reports, and other business needs. 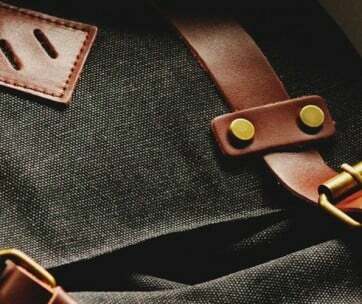 It also comes with genuine leather shoulder straps in addition to the leather handle. Heavy duty sippers provide security to the various pockets and compartments of this handy briefcase. Yearning for the perfect men’s leather gifts that can easily be used in more ways than one? How about adding a very unique, vintage, and rustic look in the fray to give you a very one-of-a-kind gear that is sure to be the envy of everyone else in the office? If you believe these are all possible, then you may have to get the KomalC Retro Buffalo Hunter Leather Laptop Bag. It’s not just a laptop bag, however. It can also serve as a messenger bag, a courier bag, and even a briefcase. But what’s really amazing about it is its very rustic finish. Here’s the thing about the Dreem iPhone Wallet Case: it’s not really made of genuine leather. However, this is clearly not a problem since its design has been specially handcrafted to look like real, genuine, authentic leather. The faux leather materials put into each Fibonacci exudes with luxury that even the serious leather enthusiast will not be able to tell the difference. More than being one of the great men’s leather gifts, however, the Dreem wallet folio comes with amazing RFID protection so you can safely secure your credit cards and other items in its compartments. Plus, it won’t detract from the elegance of your iPhone. If you have someone who already has the iPhone 6, 6S, 6 Plus, or even the 6S Plus, you might want to consider giving him the Apple OEM Leather Case to help protect his precious device against bumps, scratches, shocks, drops, and other accidents related to butter fingers or otherwise. The great thing about this potentially great leather gift ideas for him is that these are essentially made specifically for the iPhone 6 series of smartphones. These are not your generic leather cases that look and feel cheap. It’s made with european leather and completed with a soft microfiber interior lining for added protection. It’s not the beard comb that’s really amazing in this Hunter Jack gift set but rather the PU leather case that comes with the handcrafted dual action facial hair comb. Perhaps one of the most unique leather gift ideas for him especially if he’s into grooming his facial hairs, the Hunter Jack is made of premium sandalwood, giving him a luxurious feel with every stroke of the comb on his mustache or beard. And when he’s done, he can always marvel at the exquisiteness and luxury of the PU leather case complete with an embossed Hunter Jack logo on its face. Leather gifts for men list wouldn’t be complete without a good leathr wallet. Everyone knows how popular a brand Tommy Hilfiger is especially when it comes to fashion. Such is what you get if you purchase the Tommy Hilfiger Men’s Leather Wallet. It may look like any other men’s leather gifts except that it carries one of the most iconic names in the fashion industry. More than its pop culture status, however, the Ranger Passcase comes fully embedded with only the latest in RFID blocking technology. This RFID wallet helps protect the confidentiality of the information embedded in your cards, protecting you against skimmers and against identity theft. Of course, it’s a stylish way to keep your money, too. Forget plastic passport cases that do nothing to protect or even venerate the value of your US passport. Trust only the Villini Leather Passport Holder as it comes with a full 2-millimeter thick genuine luxury leather complete with interesting designs that talk about the importance of your travel document. The Villini’s front is 3D embossed with the official coat of arms of the United States while the back is elegantly embossed with the image of the famous Brooklyn Bridge. Available in 9 different colors, the Villini passport holder makes for one of the truly functional and elegant leather gift ideas for him. Most toiletry cases are made of clear plastic while some are made of canvas and other types of cheap materials. For a really luxurious take on organizing your travel grooming kit, you’d have to get the RusticTown Leather Toiletry Bag. This splendid leather gift ideas for him is made of genuine buffalo leather, expertly crafted by hand to give you luxurious look and feel. The interior is lined with waterproof material to manage your wet grooming kit such as shaving cream and cologne. Of course, you can easily store anything else inside its spacious interior while retaining its elegant nature. You’d be surprised at how amazingly cool the Sovereign-Gear Leather Journal is. The manner in which the travel diary has been crafted is so rustic and vintage that it definitely looks like some invaluable artifact from a long lost civilization. The imperfections in the premium buffalo leather adds to its almost-mystical qualities. You can almost smell the special oils that have been ingeniously applied to the leather, further improving its superb characteristics. If any, writing on the pages of this unlined cream paper is awesome as one of the many interesting men’s leather gifts you could ever present to the man in your life. One of the issues that confront many men with regards to conventional dress belts is that most come with holes that somehow detract from the overall aesthetic simplicity of the fashion accessory. 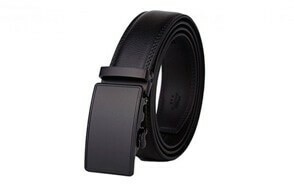 With the Dante Men’s Fashion Ratchet Dress Belt, you no longer have to bother yourself with these pesky holes while still assuring yourself of a secure fit around your waist. The Dante’s Fashion Ratchet Belt makes our list of exceptional leather gift ideas for him primarily for its unique hole-less design. It comes fully integrated with 38 adjustment points so you get the perfect and fashionable fit every time. Love this product? 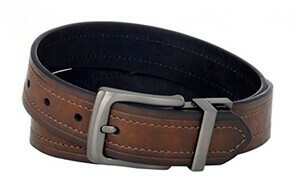 Check out our review of the leather belts for more amazing belts like this. 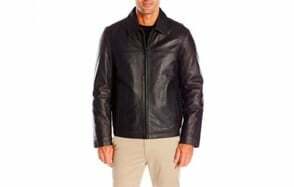 The Tommy Hilfiger Men’s Leather Jacket is one truly astonishing piece of protective garment that can work with formal business attire or even with casual everyday clothing. The genuine smooth lamb leather used in its panels gives it the kind of luxurious feel and look that is characteristic of any authentic Tommy Hilfiger fashion. These pieces of men’s leather gifts from a renowned fashion icon come with four welt pockets, two each on the interior and exterior panels of the jacket. Owing to its leather construction, it should never be machine washed, only dry cleaned to help ensure the longevity of its material. Love this product? Check out our down jackets review for our top picks. Don’t ever go to a formal gathering or even a business meeting wearing your ordinary shoes. For such special occasions, only the best will suffice. And when it comes to formal footwear you can always count on the quality craftsmanship and superb pedal comfort of the Calvin Klein Men’s Brodie Oxford. Its plain toe design is just perfect for that formal wear with only its signature side panels and the classic shoelace providing modest yet equally stunning contrast. The Brodie Oxford’s upper is made of smooth leather, pampering your feet with luxurious feel while the footbed is padded for optimum comfort. If you are thinking about leather gifts for men, this should be one of your first choices. Designed for everyday casual wear, the Clarks Men’s Tilden Walk Oxford makes for a fascinating men’s leather gifts primarily for its breathable leather uppers. You clearly won’t expect such a feature on a fine footwear such as the Tilden but it sure does aim for maximum comfort for any type of feet. It’s got a fully synthetic outsole, providing exceptional durability and sturdiness especially when used on terrain that’s neither flat nor smooth. The outsole has also been finely ribbed to give you exceptional grip so you won’t be slipping while doing your thing. The Tilden also has an elastic side gore, ensuring optimum fit. Find more great products like this by checking out our guide to Rockport shoes. Say goodbye to ordinary work gloves that do a mediocre job at keeping your hands toasty warm and protecting them from cuts, abrasions, and other potential injuries while you’re busy at work. Say hello to a splendid leather gift ideas for him that is sure to make your man feel so important. The Carhartt Men’s Insulated Leather Glove is the perfect present for the modern-day handyman and driver who require exceptional thermal insulation for his hands so he’ll retain optimum functionality of his digits. The Carhartt is constructed of an inner polyester lining for comfort fit and an outer genuine leather for superb protection. Still at a loss as to what men’s leather gifts to give to that special someone in your life or perhaps that colleague of yours you admire so much for his work ethic and amiable personality? You can stop searching as Majestic Goods Office Supply is bringing to you its signature Leather Desk set that comes with a paper tray, picture frame, pen stand, memo holder, letter opener, blotter, pencil holder, and even a calendar holder. Each of these items is meticulously made by hand from durable PU leather, although some design elements are constructed of plastic, metal, and polyurethane for added strength. Wristwatches have always been perennial favorites as splendid gifts to gentlemen with very fine and discriminating tastes in life. Add the exquisite nature of genuine calfskin leather as an elegant watch strap and you get the Fossil Men’s Grant Stainless Steel Watch. The FS4813 features a 44-millimeter stainless steel wristwatch case and a dial window made of high quality mineral. The textured black dial provides a stunning backdrop to its silver-toned Roman numerals complete with sword-themed hands. Three subdials provide additional timekeeping functions to the Fossil Grant. It’s also water-resistant up to 165 feet, although you’re not supposed to immerse it in water. Check out oour essential waterproof watches guide for more great watches like this. We are completing our leather gifts for men review with this amazing product. Feeling like Indiana Jones with his signature outback hat? Well, you can always feel adventurous wearing the Dorfman Pacific Weathered Cotton Outback Hat. Its weathered appearance gives the Dorfman a very rugged, almost vintage look that should speak soundly of your adventures in the great outdoor. It has a brow band that’s effective in wicking away sweat while providing for a smoother surface on your forehead. The brim may only be 2.7 inches wide but its 360-degree placement helps ensure adequate shading. What’s more, the Dorfman Pacific is rated with UPF 50+ for extra UV protection. The chin strap helps secure it on your head, too.